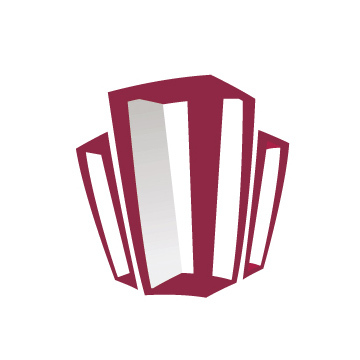 The Absorption Rate (inventory supply) is a metric indicating the number of months that the current inventory will take to sell based on demand (sales) if no new listings come on the market. 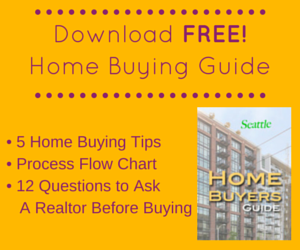 This is the barometer used to determine market condition – buyers market, sellers market, or a balanced market. It’s calculated by dividing inventory by the monthly sales volume. For the figures below I used the average monthly sales (closings) for the year and am expressing the absorption rate in months of supply. With the exception of high-end properties, the Seattle condo absorption rates have been fairly consistent across the price spectrum, within a 6-8 month supply based on closed sales. The citywide rate was 7.5…no surprise, it’s still a buyer’s market. In comparison, Seattle’s single family market reflects a balanced to slight seller’s market with a 3.6 month absorption rate. Surprisingly, the lower price tiers had high absorption rates, which is a somewhat counterintuitive considering that the majority of condo sales were priced under $300,000. Though, short sale and bank-owned properties account for nearly 38% of the inventory under $300,000, and short sales have a high non-closure rate. Sales of $1 million-plus condos are up significantly compared to 2010, but there is still considerable inventory available. However, we’d expect they would take longer to sell so it’s not unreasonable for $1 million-plus properties to have a higher absorption rate. 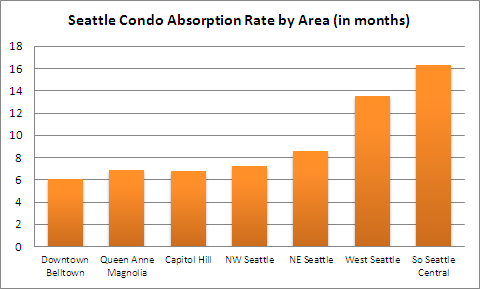 As with the pricing tiers, the Seattle condo absorption rate also varies by neighborhood areas. The Seattle core neighborhoods (downtown, Belltown, Capitol Hill and Queen Anne) have the most inventory, approximately 59% of the city’s available condos. They also currently have the lowest absorption rates, reflecting a balanced to slight buyer’s market environment. Convenient access to work, entertainment and recreational amenities, and neighborhood businesses contribute to their desirability. Moving out from the city core, the condo supply increases with the South and West Seattle areas exhibiting a strong buyer’s market climate. 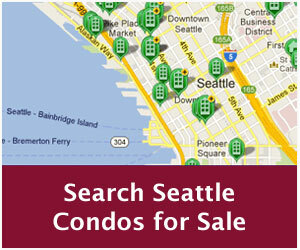 Source: Data is from the NWMLS but calculated independently by SeattleCondosAndLofts.com. Note, the absorption rate was calculated using the number of NWMLS listed condos on August 25th, 2011 and is subject to change over time. 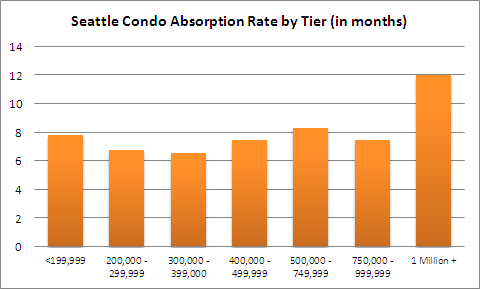 Wow absorption rate is actually pretty good for condos. In Philadelphia the rate for condos is really lagging behind homes. It looks like a pretty balanced market, even in the high-end sector. Have there been any (if at all) REO’s or short sales in the $1M+ price spectrum? @Wailea – specifically for Seattle condos, there’s been 7 REO (bank-owned) closings this year, all at one building that was foreclosed. There have not been any $1 million+ condo short sales this year.